Last spring, Minnesota Sharp-tailed Grouse Society and Minnesota Prairie Chicken Society members and others gathered for two Volunteer Brush Cut Habitat Days at Larix Wildlife Management Area near Gully in northwest Minnesota and St Croix State Park. They cleared brush to enhance open and brushland habitats on public lands and provide support for Conservation Partner Legacy (CPL) grants. These grants fund additional open and brushland habitat management on public lands and require a 10% match. 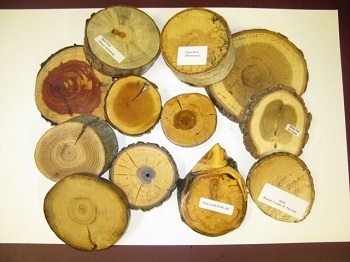 According to Jodie Provost, Private Land Habitat Specialist, Aitkin, "Thirty-four participants, including 24 students from high school, University of Minnesota - Crookston, Bemidji State University, Vermillion Community College, and South Dakota State University, cut tamarack on possibly our most challenging site ever. We have never had students attend from out of state before! We shattered the records for both number of participants and distance traveled to attend!" Nine acres were restored to open habitat and $6,510 of CPL match was generated. Emily Hutchins, Matt Morin, Amy Westmark and Jodie Provost of MN DNR Wildlife staff organized and oversaw the site work. 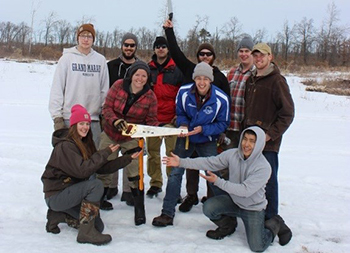 Congrats to University of Minnesota - Crookston for again taking home the coveted Golden Saw Traveling Trophy by rallying the most students at Larix WMA and to Vermillion Community College for winning the award at St Croix State Park! To see these volunteers in action, along with before and after footage, go to the YouTube video Prairie Grouse Brush Cut created by Sabin Adams. After the event, the MN DNR Northwest Roving Crew polished up the site with chain saws, expanded it and saw sharp-tail grouse tracks in the snow! U of M Crookston at Larix WMA proudly show their Golden Saw Traveling Trophy Award. Vermillion Community College proudly shows their Golden Saw Traveling Trophy Award at St. Croix State Park. Brian and Patrick Oelrich are twin brothers who fish competitively and volunteered at several FiN events this past year. They worked in the rain and sun at fishing clinics with participants of all ages, helping many of them with their first-ever fishing experience. Brian and Patrick also worked a fish identification booth at the annual Chaska Area Fishing with Friends Fishing Clinic, held for over 200 participants and their families. They spent time with each person who visited the booth educating them on correctly identifying Minnesota's most popular sport fish species and shared their experience and knowledge. According to Mario Travaline, FiN Specialist, "Brian and Patrick work well with youth, engaging them and getting them excited about fishing and spending time outdoors. They did a very good job this past year and continue to seek volunteer opportunities with DNR Fisheries in the West Metro Area." Thank you Brian and Patrick! Pheng Xiong has been an intern for the Urban Roots conservation crew all four of his high school years. In this position, he's taken on the leadership role of teaching at DNR public events, leading nature walks and restoring the landscape at the DNR Willowbrook Campus located on Warner Road in St Paul. "No matter how hot, buggy, wet or "sticky" the task, he always has a smile and great attitude. He has transferred the knowledge he has gained to advocate for, design, and implement a rain garden at his high school," said Gina Bonsignore, Regional Planner, Central Region, St Paul. "He has done so much to help improve our site and educate his community about the importance of natural resources." Since creating a department-wide DNR Volunteer Program in 1982, citizens have engaged in more than 11 million hours of volunteer service focused on managing our state's natural resources. How does Minnesota rank for volunteering? Minnesota ranked #2 in the nation for volunteering in 2015 with 1,560,667 volunteers donating 155.41 million hours of service at a value of $3.3 billion. Minneapolis-St Paul was ranked #1 in volunteering among large cities in the U.S. The Twin Cities was ranked #2 in college students and #2 in Millennials volunteering.